Blog post by dog behaviourist Laure-Anne Visele, The Hague, explaining dogs’ two fear periods. Call the 911: it’s a wheelie bin! Spot, a 4 months old Border Collie cross, had never been scared of anything. He loved everything and everyone. In fact, he was driving me, his puppy class instructor, to desperation as he was so unflappable he didn’t even notice the mildly ‘stressful’ situations we were teaching him to cope with. Still, I wasn’t surprised when his owner, Wendy called to say that she thought Spot might have a behaviour disorder. Spot was such a perfect dog that we could see Wendy was getting a little complacent on socialisation and habituation exercises. We didn’t seem to get through when we were telling her: He loves the vet now, we believe you. And that is precisely why now is the best time to take him to the vet’s for great experiences, again and again. He’ll change a lot come adolescence and then you’ll be thankful you gave him a ton of positive experiences at the vet’s to buffer for what’s to come. Fast forward to a 4 months old Spot and, not only had he become petrified of the vet’s (and started growling at the vet staff, to Wendy’s embarrassment), but he suddenly started to balk at objects he’d seen all his life, like the wheelie bins on the street corner. He used to be crazy about Tom-the-neighbour and now, Spot acts like he’s a serial killer. Whatever had happened to Mr. Unflappable?… His second fear period. Dogs’ fear periods: what’s the point of them? Dogs are, like us and most mammals, an altricial species. That means that their parents – at least their mom, in the case of dogs – take care of them after birth and don’t leave them to their own devices. Just after birth, canine – and human – puppies leave the job of danger detection to the parent in charge. Ever noticed how babies aren’t scared of heights or fire? They’re more likely to see a lion as a fluffy stuffed toy than a predator. It’s the same with dogs. As they explore further and further from the litter, though, they need to start getting a sense of danger. Don’t do that, and you’ll be fluffy lion’s next lunch. As a general rule, the more independent they get, the more cautious they become about the unfamiliar. There are two phases of a dog’s life during which fear gets a boost. During these periods, one half-nasty startle can be enough to create a lifelong phobia. Dogs’ fear periods: when are they? These two phases correspond to boosts in independence from their caregiver. At repeat intervals, between 4 and… 18 months! That second fear phase is not continuous, thankfully. Dogs’ fear periods: what can I do? If you notice that your dog has already developed a problem towards something specific (like Spot and the wheelie bins), then try OhMyDog!’s (dog training school in The Hague) Make me brave protocol. Interested in the nerdy details behind a puppy’s developmental periods? Read on. Neonatal period, 0 to 2 weeks: From the age of 0 to 2 weeks, they can’t move much anyways. They can’t see and they can barely wriggle. Absolute zero sense of danger. Tip for predators: if you want yourself an easy meal, now’s the time. Transitional period, 2 to 3-4 weeks: Their eyes open and they take their first steps. It’s the start of that oh-so-cute clumsy puppy walk. Still not much of a fear response. Top tip for predators: still an easy lunch, and a little bit fatter than last week. Awareness begins, 21-22 days: They become aware of their non-social environment. They take in the sights, feels, scents and sounds around them: the surfaces they walk on, and the household sounds they hear. Still no fear. Whatever you expose them to now will start to be classified as normal and safe stuff. Now’s the time to slowly introduce new textures and sounds into their environment. Beware though: no sudden change of environment right now. This could be hugely detrimental. Socialisation to other dogs, 3-5 weeks: They start interacting more consciously with their litter mates and mother, and imprint dogs as co-specifics: they learn that dogs are social companions, neither predator nor prey. They learn impulse and bite control from their mom who has started to chastise them if they hurt her with their needle-sharp teeth. They practice the whole shebang of canine social interactions through play with their litter mates. Around 4-8 weeks, the mother weans the puppies. This is instrumental in teaching puppies to cope with frustration. This is the period where they learn that humans are also social partners. This period is considered the golden period of socialisation. This is the period that we want to cash in on to expose the dog to as many situations as possible, so he becomes bombproof later in life. Beware, though: do not overwhelm the pup in the name of socialisation: this achieves the exact opposite effect. Why is it a golden period? Because it corresponds with a peak in learning abilities. Learning = associating situations, people and objects with an appropriate emotional response. In other words, the pup is a sponge at this age and whatever he repeatedly encounters that is not scary or painful is getting stored as a safe situation in his long-term circuitry. Want him to trust the vet’s? Strangers? Kids? Wheelchairs? People with hats? Loud passing trams? Public transport? Car travel? Get on the road already! Socialisation-wise, 8-10 weeks is a good age to rehome the puppies to their permanent home. If you have a choice, privilege leaving the pup until 10-11 weeks with his mother and littermates, though. This is to do with the fear imprint period (see below) and teaching him impulse control. If you choose for this option, be sure that the breeder is serious in his or her socialisation efforts. Avoid long and potentially traumatic trips – so much for the truckloads of Romanian puppies. Postpone any non urgent surgery or medical procedure. The ranking period, From about 10 weeks to 4 months: This is where they learn to stand up for themselves and try their paws at conflict resolution. They are no longer the pliable, happy-go-lucky puppy towards their littermates as they learn to become more willful. The puppy is trying to carve a spot for himself in the world. 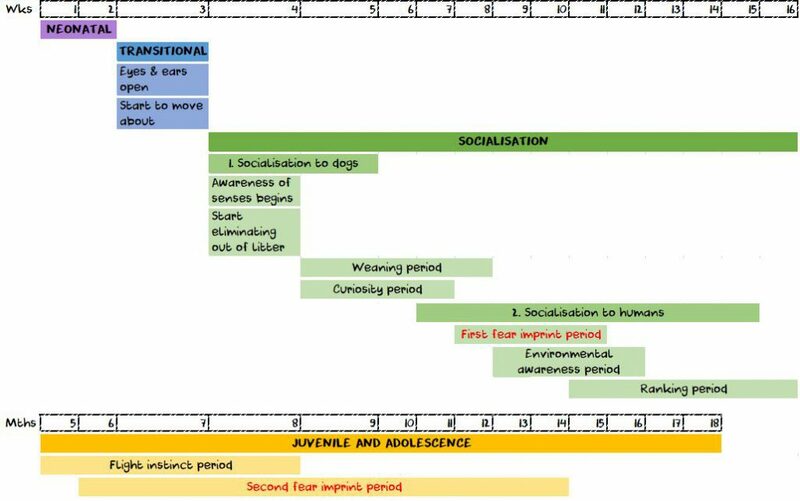 Juvenile and adolescent period, 4 to 13-18 months: This is when your pup is starting to become a grown up (socially speaking. For some breeds, there’s still plenty of physical growing to be done). The flight instinct period (4 to 8 months): This is when a pup becomes drunk on freedom. A pup with a previously perfect recall suddenly takes off to explore the world and comes back when he damned well pleases. This is when, for some dogs, it is advised to re-start working on the recall, but with a long leash this time. He might also start chewing a lot more so give him plenty of legitimate outlets or your furniture might take a beating. The second fear period (6 to 14-18 months): This is not so much one continuous period as a series of short periods popping up once in a while. This is when you might start seeing territoriality rear its ugly head (stranger = very much danger in the dog’s mind, particularly on his home turf). 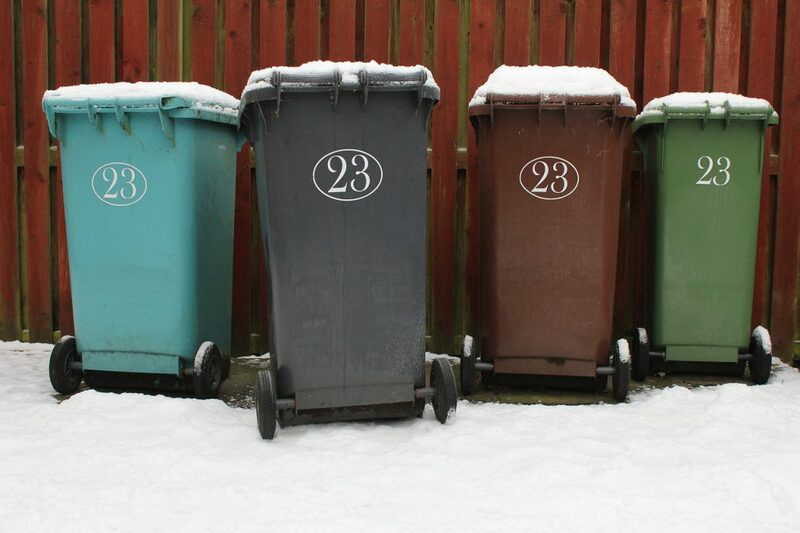 Wheelie bins: By blue budgie, downloaded from Pixabay. License: CC0 (no modifications made). Developmental periods chart: By Laure-Anne Visele, 8 June 2018. All rights reserved. This entry was posted in Dog behaviour and tagged developmental phases dogs, developmental stages dog, dog behaviourist the hague, dog training the hague, fear phases dogs, fear stages dogs, honden gedragstherapie den haag, hondentraining den haag, puppies, puppy. Bookmark the permalink. Post a comment or leave a trackback: Trackback URL.